Why restrict yourself to just a fountain or waterfall when you can have both. All Hozelock Cyprio pumps that are large enough to run both a fountain and a waterfall are supplied with a T piece to split and control the flow. 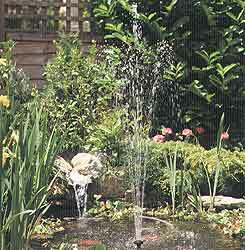 These are designed to allow water to flow to a fountain and to a waterfall.